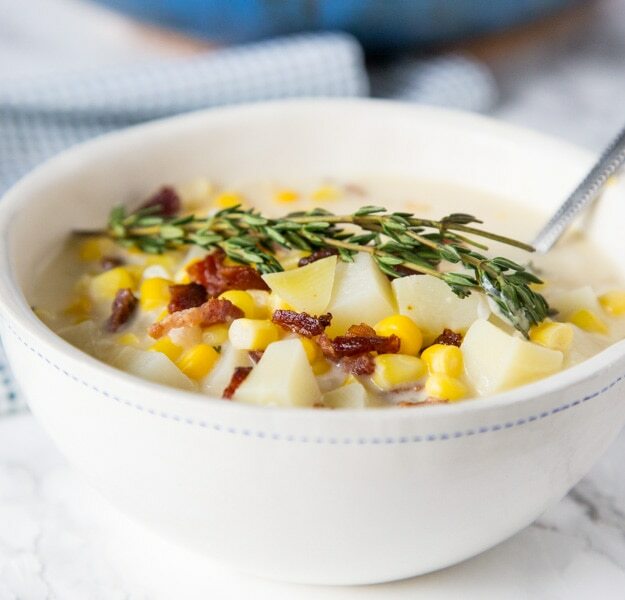 Potato Corn Chowder – a light and creamy corn chowder with lots of sweet corn, fresh thyme and tender potatoes. A warm and comforting soup you can make any night of the week! In the winter, nothing beats a cozy and warm bowl of soup. Crock Pot Chili is on repeat all winter long at my house. When the weather gets cold there is no better way to warm up. And if you can make my favorite biscuit recipe to with it, even better! 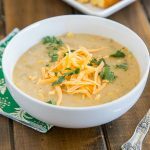 My family loves Mexican flavor, so Southwest Corn Chowder is one of our favorites. But this is a more traditional version. Potato corn chowder is hearty, but still light and creamy. Everyone loves soup in the winter. And if you can make it quickly and easily even better! 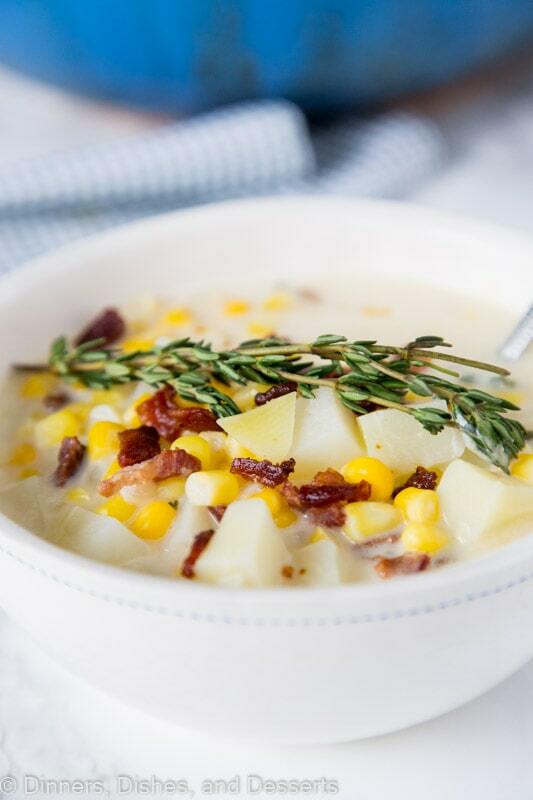 This corn chowder recipe is super simple to make, but oh so good! I lightened up the broth, so you don’t have to feel any guilt! There is only 1/2 of a cream in the whole recipe! The potatoes start to break down in the broth, so they help make it creamy and delicious. So is corn chowder soup healthy? It depends on how you make the broth. This is definitely lower in calories and fat than other cream soups. 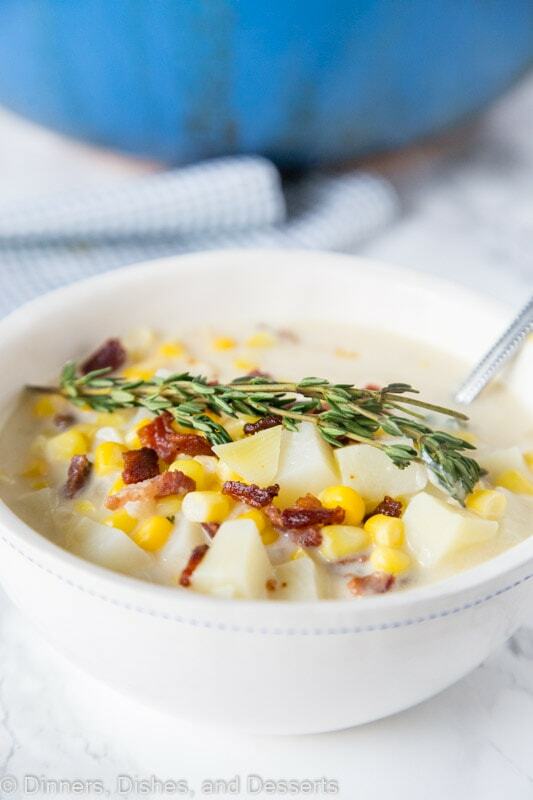 This potato corn chowder can be make pretty quickly any night of the week. It is great to make ahead and have sitting in the crock pot on warm waiting for you. My corn chowder recipe is meat free, just a little bit of bacon to garnish. This Clam Chowder looks amazing if you are looking for a seafood version. I used frozen corn for this, and it was really good. But, I can’t wait until next summer to freeze fresh corn to use in it. 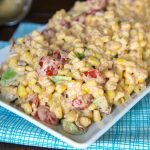 If you have some fresh corn in the freezer, this is the recipe to break it out for! 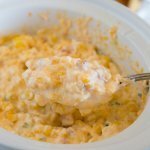 And if you have extra corn sitting around this Cheesy Corn Dip is a huge hit at get togethers. You want to use a starchy potato in this chowder. It starts to break down and helps thicken the soup, so you don’t want anything waxy here. A russet or baking potato is perfect for this. They will get nice and tender and help the broth can nice and creamy. 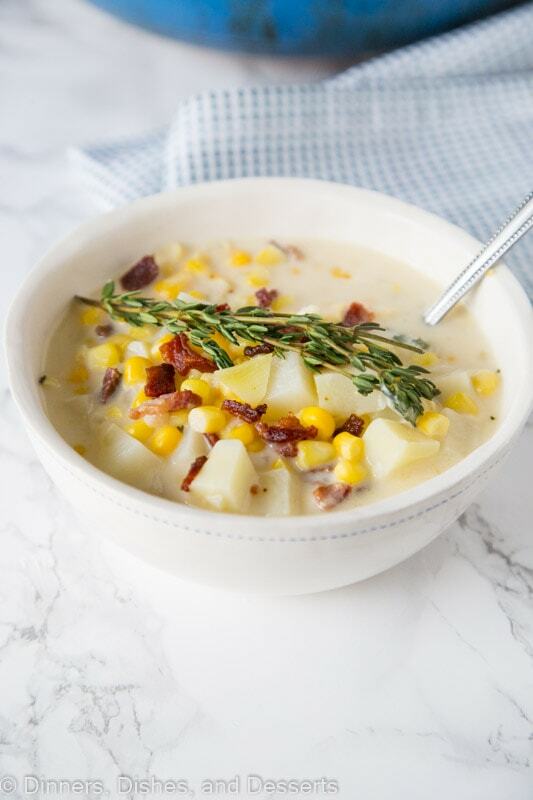 Potato Corn Chowder - a light and creamy corn chowder with lots of sweet corn, fresh thyme and tender potatoes. 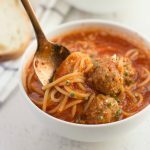 A warm and comforting soup you can make any night of the week! In a large pot, heat the butter and olive oil over medium heat. Add the onion, garlic, and thyme and saute until soft, about 8 minutes. Add flour, and stir until is is completely mixed in. Pour in chicken stock and bring to a boil. Add milk, half and half, and the potatoes. 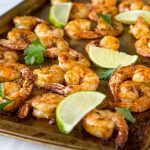 Bring to to a rolling boil for at least 10 minutes. The potatoes should start to break down to help thicken the soup. Stir in corn. Season with salt and pepper. Cook for 10 - 15 minutes, until the corn is soft. Chowder is great for this time of year. 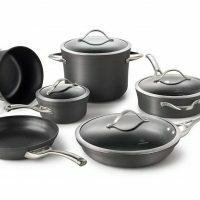 My husband would love this too. It looks so comforting and delicious! This looks wonderful. 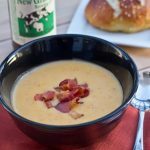 I love corn chowder, especially with bacon! That FN recipe was one of the first I mastered after my husband and I got married. Although I usually add in shredded chicken too because my husband just won’t accept a meal without meat:). I like that you used fat free evaporated milk. 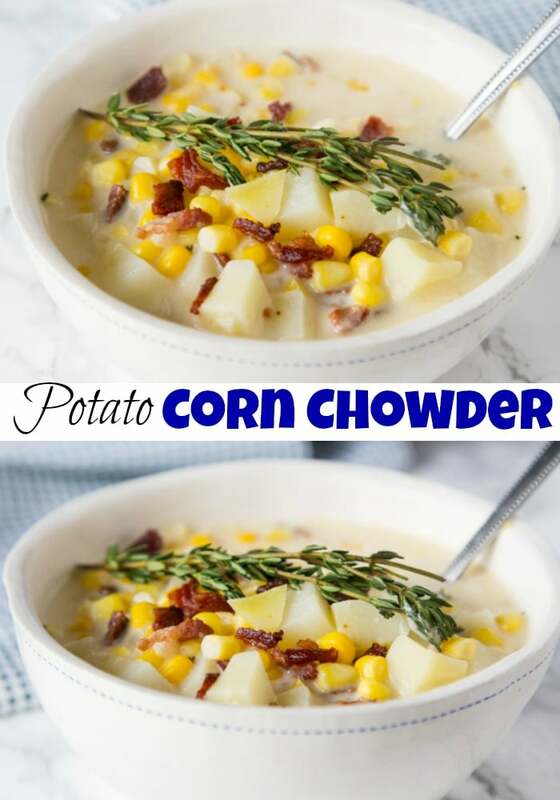 I will have to try that the next time I make corn chowder. And beautiful pictures too! Corn chowder has been on my list for too long as well. 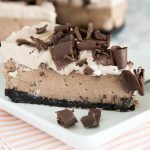 I need to bump it up on my list of things to make after seeing this! I love what you did with this recipe. Can’t wait to try it! It’s not that cold here, oh wait it might be cold tonight. 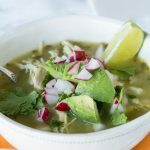 This soup makes me want cold weather! Oh yum! Your pics are beautiful! This sounds yummy! I’ve wanted to try a corn chowder for a couple months now. 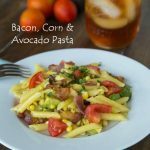 This recipe looks fantastic, definitely going with the bacon topping! Erin this looks so good! 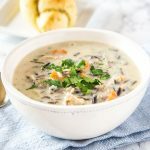 My husband was just asking me to make chowder, so I will be giving this a try soon! I’ve never tried evaporated milk in a soup before – thanks for the great tip! This soup looks delicious. I love the idea of freezing corn in the summer to use during the winter. That would make the soup even better! Oh, I love corn chowder…and I may not be able to wait till July to try it with fresh corn. Great tip about the evaporated milk…my mom has a wonderful wild rice soup that calls for it instead of cream…so yummy. Great idea with the evaporated milk. It looks delicious! 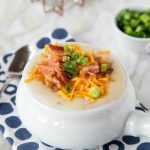 I think this is a soup my husband would really enjoy seeing as corn is one of the only veggies he likes, especially with that bacon on top! PERFECT for cold days! 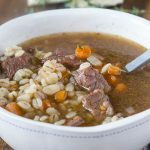 I love this hearty soup! Delicious and perfect for a snow day. This was a great quick dinner that everyone enjoyed! 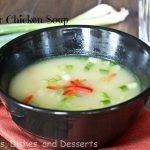 The ultimate comfort soup! So delicious! I am craving a big bowl of this chowder right now! Looks fabulous! This looks absolutely amazing!! Saving! 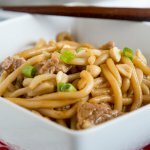 Copycat recipes are the best! This one I have to make cause I love it! This is warming me up just thinking about it! Love a good corn chowder! OH MY GOSH THAT WAS DELICIOUS! THANK YOU SO MUCH! So creamy and delicious! Can’t wait to try! this was bursting with flavor! Two thumbs up at our house! This chowder is perfect on a chilly winter day! 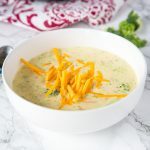 This soup is so delicious and creamy! I love how budget friendly it is too!